Thank Ebola and late capitalism. For 27 years, ESPN's primetime NFL games were the most-watched programs on cable. Now that honor belongs to the zombie apocalypse. The Walking Dead brought in 17.3 million viewers for its season five debut, 'No Sanctuary,' making it the most-viewed episode of a drama ever to air on cable TV. Monday Night Football brought in 13.1 million. The second episode kept up the momentum, and further demonstrated that the institution's decades-long reign as the ratings king could be drawing to a close. That horror fiction about the end times has supplanted the closest thing we've got to Roman bloodsport as our premier choice for spectator entertainment is, at the very least, an interesting signal in shifting American cultural tastes. At most, it's symbolic of a deepening pessimism and nihilism felt by a rich (but unequal) and increasingly nervous society. 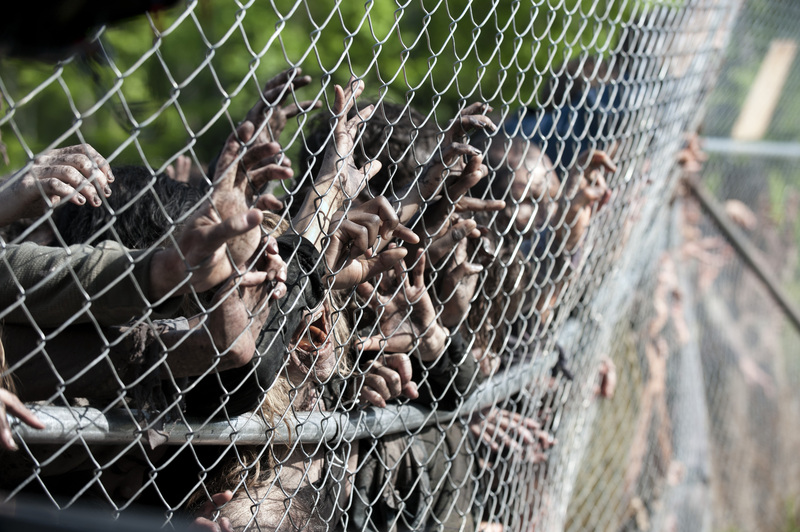 Either way, the Walking Dead staggering past the NFL in viewership is a loaded milestone. Imagine the Romans, still enamored by the live-action thrills provided by gladiators, filling the Coliseum instead with a production of the epic poem Aeneid—but only Book 6, where the hero Aeneas goes to the Underworld to hear grim prophecies of a violent near-future. The development is a little strange: Walking Dead's audience keeps growing, despite any serious improvement in the show (and I say this as a fan and dedicated viewer). The acting is still stiff, the production values haven't changed much (they've always been good), and a full half of last season consisted primarily of characters (none of whom are all that likable or well-drawn) wandering around, following scrawled signs left alongside a railroad track. The events of a given episode airing today could just as easily take place in the first season—band of survivors shuffles onward, fights zombies, endures bouts of horrific violence from other humans, kills zombies, takes brief, weary solace in fleeting togetherness. Rinse, repeat. So what gives? How is this show shattering records? It could be that we're drawn to the zombie. "We are more interested in the zombie at times when as a culture we feel disempowered,' Sarah Juliet Lauro, an assistant professor at Clemson University whose Twitter handle is @ZombieScholar, told the Associated Press last year. "And the facts are there that, when we are experiencing economic crises, the vast population is feeling disempowered," she continued. "Either playing dead themselves or watching a show like Walking Dead provides a great variety of outlets for people." If Lauro is right, TWD's booming popularity may be a sign of society-wide discontent—her research indicates that the more helpless and desperate non-zombie humans feel, the more we turn to zombies to channel our frustration. "I think this all started at the convergence of the turn of the new millennium," Lauro wrote me in an email, "an economic downturn that suggested capitalism might not be working as well as we thought, a terrorist attack in the US that seemed to lead to a war that had NOTHING to do with that attack, and an increasing awareness of the damage done to the planet, ie, climate change. There has been the feeling that we are headed for an uncertain and bleak future, and since 2003, the zombie's popularity has been on the rise." During the 90s and early 00s, we watched the US economy surge and American businesses grow, we watched globalization lower bottom lines and ship jobs overseas, we watched wealth concentrate ever more heavily at the top—we may even have watched those things a bit closer, if we weren't so busy watching grown men give each other concussions. We've hardly returned to the salad days of Steve Young and Brett Favre, worry (and work email-loading iPhone)-free Sunday game day BBQs, and intact pensions of the 90s. But we've still got our Coliseum, our agent of mass distraction—it's almost cliche to compare the NFL to gladiatorial combat at this point—and don't get me wrong; we're still watching that, in as great or even greater numbers than ever before. Each new Super Bowl seems to set an insane new viewership record, even if I can't remember a particularly interesting one. It's just that our urge to watch the world explode after the athletic spectacle is over is bigger than ever. We stagger out from the advertisement-fueled spectacle into a world of lower wages, greater austerity, fewer public services, and less opportunity. Since 2009, 95 percent of the economic gains have gone to the wealthiest 1 percent of Americans, and struggling citizens around the country are feeling it. On top of it all, apocalyptic current events are adding to the despair, and possibly fueling zombie dominance. "With Ebola and ISIS, they represent fears of the unknown and evil," Glenn Stutzky, the anthropologist behind Michigan State University's popular zombie survival class, told Business Insider. More than a few observers have noted the similarities between our cultural infatuation with zombies and our panic over Ebola. Zombies have cultural ties to Africa, and the Ebola victims sort of look like zombies, bleeding from the eyes, and, to American viewers, embodying a dangerous Other. So we're treating everyone as a potential zombie, ushering minorities who cough off of planes and mobilizing the military into strike teams. "It feels like we're moving into apocalyptic times," Stutzky said. Which is a little disconcerting. The media critic Douglas Rushkoff believes our infatuation with apocalyptica is a symptom of what he calls "present shock"—an inability or unwillingness to look to the long term to solve more distant problems. The Marxist scholar Frederic Jameson, meanwhile, is credited with popularizing the notion that it's easier to imagine the end of the world than the end of capitalism. Interesting, then, that it may be the pitfalls of capitalism that are driving us to imagine the end of the world in the first place—and to revel in it, weekly—effectively preventing us from dreaming up more productive ideas about where the future is heading. The most popular event of our time is no longer a rousing display of excess and athletic might—it's a TV show about despair, survival, starting fresh in hostile climes, and rebuilding. Maybe the Walking Dead is more popular than the NFL because we see ourselves not in the character's shoes, but in their situation. Football can distract us for so long, but the characters in the Walking Dead, Stutzky says, "they're like our apocalyptic family."